What a great way to spend a late winter evening! In the greater Boston area, tune in on WGBH Channel 2 at 7:30 PM on Thursday March 8th for a wonderful hour-and-a-half of Jewish music. Click HERE for a video clip. Enjoy beautiful sacred and secular songs from three rising stars on the world’s Jewish music scene. Backed by a 33-piece orchestra and male choir, the cantors perform in Amsterdam’s revered 17th-century Sephardic synagogue known as “The Portuguese Synagogue”. 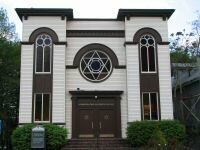 Click HERE for synagogue information.